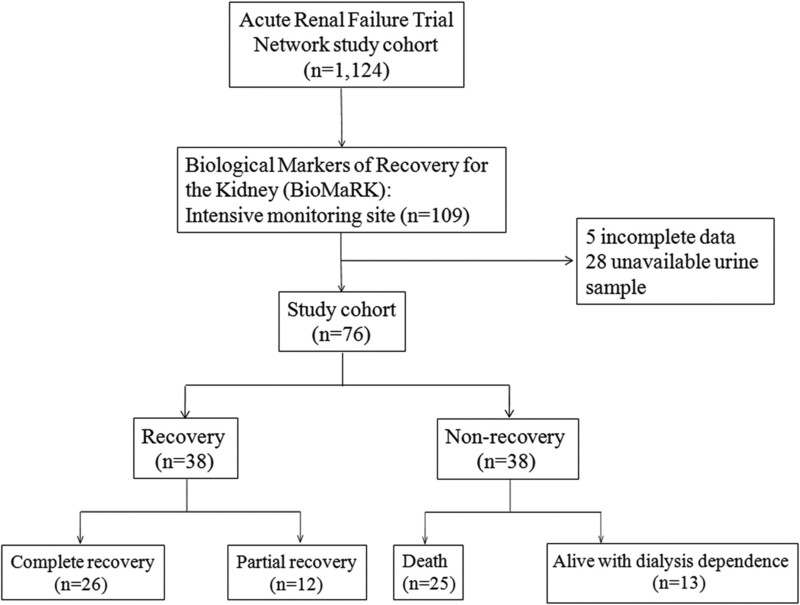 Subject disposition for the Biologic Markers of Recovery for the Kidney (BioMaRK) study cohort. Box plots for the six biomarkers evaluated. The vertical box represents the 25th percentile (bottom line), median (middle line), and 75th percentile (top line) values whereas the vertical bars represent the intervals between maximum and minimum values: (A) urinary neutrophil gelatinase associated lipocalin (uNGAL) levels, (B) uNGAL/matrix metalloproteinase-9 (MMP-9), (C) urinary IL-18 (uIL-18), (D) urine hepatocyte growth factor (uHGF), (E) urinary cystatin C (uCystatinC), and (F) urinary creatinine (uCreatinine). *P < 0.05, **P < 0.01. 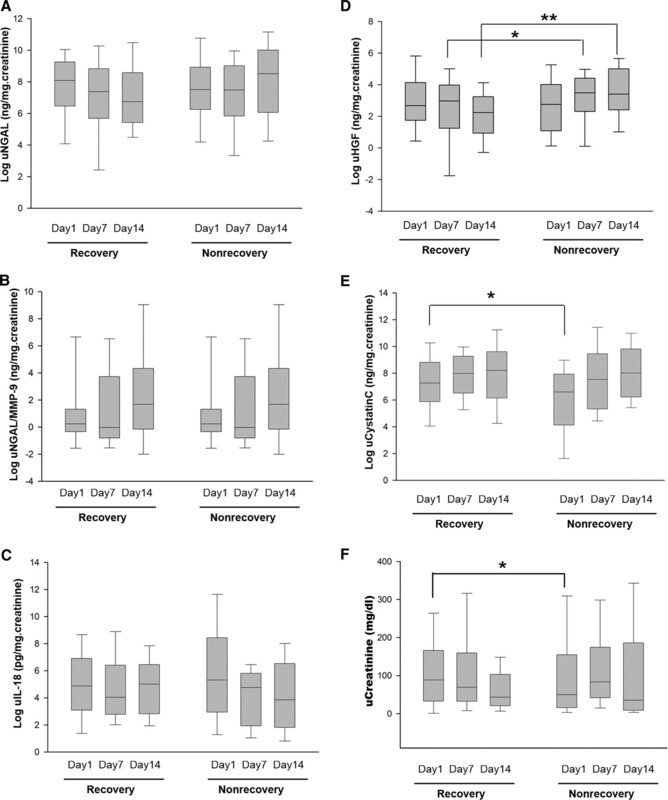 The mean (SD) of the largest relative change of uNGAL for recovery and nonrecovery were −1.1 (1.5) and + 4.8 (10.0), P = 0.01, respectively. The mean (SD) of the largest relative change of uHGF for recovery and nonrecovery were −1.0 (1.5) and + 5.8 (12.8), P = 0.003, respectively. 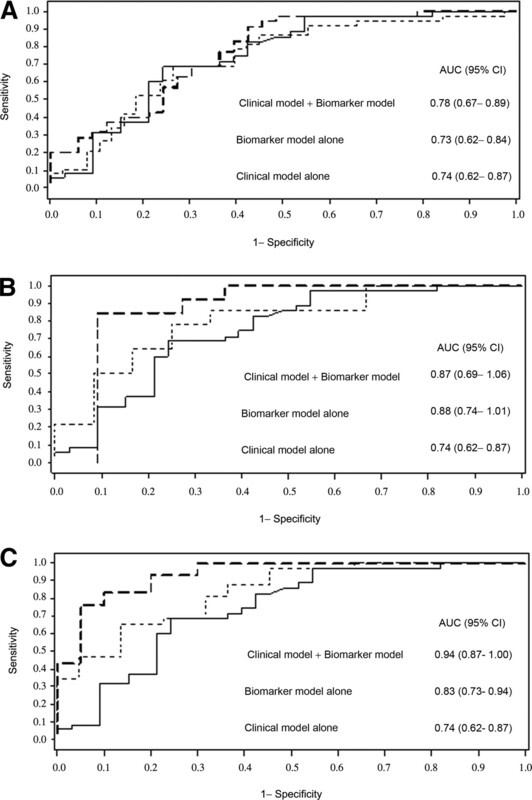 Receiver-operating characteristic (ROC) curves for the best prediction model for renal recovery. Shown are best combination biomarker model alone (thin dashed line), clinical prediction model alone (solid line), and best combined clinical model and best combination biomarker model (thick dashed line): (A) day 1, (B) day 14, and (C) the largest relative change. The clinical risk prediction model included age and Charlson comorbidity index. The area under the ROC curve (AUC) values and 95% confidence intervals (CIs) are also shown. AUC, area under the receiver-operating characteristic curve; CI, confidence interval; uNGAL, urinary neutrophil gelatinase-associated lipocalin; uHGF, urinary hepatocyte growth factor; uCystatin C, urinary cystatin C; uIL-18, urinary IL-18; MMP-9, matrix metalloproteinase protein-9; uCreatinine, urinary creatinine.